David vs Goliath: And Dadagiri Forever! 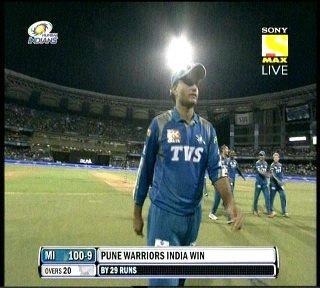 In today’s Pune warriors vs Mumbai match, it was a battle of unequal powers. The Pune team was almost on the verge of pulling out of the tourney and were brought in at the last moment through diplomatic dialogue. Their boycott of the players auctions meant they had to settle for a sucky lot of players. But, they had one Saurav Ganguly at the helm of affairs. They batted horribly and Bhajji (one of Ganguly’s proteges) led his team rather well, and marshaled his resources very well. He himself claimed the prize scalp of his mentor when Saurav stepped out to try and hoick his protégé out of the ground but did not connect and was left high and dry. Thanks to a marvelous performance by Steve Smith, who thoroughly deserves the Man of the Match award, and some timely hitting by the temperamental but talented Uthappa, Pune reached a semblance of respectability at 129… turns out they were 29 too far ahead in the end. Dada, as he is lovingly known by his fandom, was at his vintage best as the Captain today. After having opened and looked out of sorts against the faster stuff and falling to a horrid trip down the pitch, he needed to prove to us, his believers why he was special. A captain does not need to make heroic decisions on field to make changes. There are so many small decisions, fine nuances that shows the true mettle. 1. Reading the Wankhede pitch perfectly. In the pre match show Ajay Jadeja and Harsha Bhogle were wondering why Ganguly opted for only two specialist pacers on the hard Wankhede pitch. Turns out Dada knew a thing or two more than them when it came to analyzing the cricket pitch. The pitch was a slow turner where he fielded a team with as many as 5 spinners. 2. Using Murali Kartik to open the bowling was a master move. Levi is a power hitter who likes the ball to come on to his bat. But Dada brought in a left arm orthodox spinner and totally wrecked his plans. The burly batsman could not get his foot down and Uthappa was up and away with the bails in a flash! 3. Using Uthappa to keep wickets is reminiscent of his master move to make Dravid keep wickets. I do not know how many people will agree with me on this, but this move of Ganguly’s resurrected Dravid’s ODI career. Uthappa, however, is not as safe as Dravid was behind the stumps but I guess in the 20 over version, the margin of errors maybe a little wider. 4. Keeping the slips on for Dinda. That was a master move. The ball was new and had not swung prodigiously and the score to defend was meager, at best. In keeping with this, all Captains would want their fielders patrolling the outfield. But not the aggressive Ganguly! And this bore fruit when Dinda got the dangerous Rayudu to edge his first delivery to Kartik in the slips. 5. Rohit Sharma is a very promising cricketer whose known weakness is a tendency to play loose shots outside the off stick early on in his innings. Once he gets settled, however, his square drives are a treat for the eyes, but early on he is fidgety and tentative. Dinda kept bowling at him wide outside off until the last ball was almost a wide. But it was full and juicy and Sharma had a mighty swipe at it without moving his feet. The resulting edge was pouched by Uthappa. 6. James Franklin plays the sheet anchor role for Mumbai and usually provides a foil for Sachin. A very useful player in the middle of the order, his strength is his ability to hot the gaps and run the singles. Like a lot of Kiwis (Chris Harris, Scotty Styris, Chris Cairns and Dan Vettori come to the mind readily) he is a nerdler, who is handy with the bat as well as the ball. However, the way Dada used Marlon Samuels, an average offie on his best days, to restrict him was awesome. The clinical field placements, the shuffling of bowlers and the way he ran through the over rapidly (that is unusual seeing his international track record) was a lesson in Captaincy. 7. Pollard is known to have a weakness against the bouncing ball (well, who hasn’t?) but he realized that Wayne Parnell and Dinda were probably too erratic at times to keep the pressure on him. And with the ball coming at him at 125 kmph or more, a minor error in pitching it would lead to a shower of sixers and fours. So what he did was to use Rahul Sharma and Murali Kartick in tandem. Sharma, who started off rather erroneously and leaked 8 runs in his opening over ended up bowling accurately and ended his spell with a peach that clipped the off stick of Pollard. In this regard, one has to talk about Murali Kartick – one of the most underrated left arm orthodox spinners in the nation. He is probably the best in business in the shortest format of the game. While he was bowling to Pollard, he varied his length and line very well and with great precision and control. One delivery that deserves special mention was the last delivery of his 3rd over (I think). Thus far he had been bowling to Pollard round the wicket but noticing that the big guy was getting fidgety, he changed sides for the last delivery. He produced a peach of a delivery that pitched outside leg and spun away across Pollard who was left groping for the ball. 8. The way he rotated his bowlers was amazing. It was with clinical precision he held back Dinda for the last 3 overs and Kartick for Pollard. The way he brought in Bhuvanesh Kumar and used him to bowl across Franklin was also brilliant. A special mention should go to Dinda who produced a gem of a spell and deserved a fiver, and would have got it too had it not been for the ungainly defense of Munaf Patel. He ended with four scalps and has firmly placed his claim to be one of the bowlers of this season of IPL. In conclusion, Dada really showed us why some of us scream cricket is a cerebral game. I must say I was pretty impressed to see how Harbhajan, a naturally aggressive player, led the Mumbai team. He was in control all the while they were fielding but when his Boss took over all he could do was watch in despair as his much vaunted team crumbled. In fact, I am willing to wager that Bhajji might be a very good alternative to Dhoni as a Skipper for the longer version of the game. I know I will get a lot of hate mail for this assertion but Dhoni’s place in the Test team is not fixed. And as the latest overseas tours showed, he does not have the batting technique or skills to deal with the bouncing and seaming ball. I am also not a great fan of his hands-off, passive captaincy that has earned him the epithet of “Captain cool”. Sometimes Dhoni can be headstrong and closed minded. The way in which he persisted with Raina despite a string of failures was an eyesore. Every innings Raina played down under were on par with the innings played by the team’s tailenders. He refused to consider Manoj Tiwari as an alternative (and actually still does), for reasons unknown. His inability to adapt his style to the need for the moment may also have contributed to the downfall of the Indian team down under. But finally, one worry that remains for me is the batting form of Pune. Apart from Steve Smith and Robin Uthappa, the only batter to show some gumption (and hit the only sixer of the innings) was Murali Kartick. And these are not great signs. Parnell’s inability to get on with the proceedings as a pinch hitter may have been due to the slow nature of the pitch and may have contributed to Ganguly’s dismissal, but it definitely does not exonerate Dada from the responsibility of playing an ugly shot. He seemed rusty and his feet weren’t moving too well. The slice he played off Malinga was perilously close to the slip and was not the most elegant stroke in his book. His dismissal came because he, in his own style, tried to hit the opposition captain out of the ground to establish his superiority in the game. These are subtle mind games he has always been good at playing. But unfortunately, now, as he nears 40, the reflexes and responses have slowed down. I know he is the master of comebacks and is THE man to make people swallow their “specialist comments”, but I still think he should not open. Uthappa had great success opening for Bangalore in the opening IPL and today also he showed that he is ready to grit it out if need be. Maybe Ganguly should come down at 4/5 and leave the opening slot to him. That would relieve Ganguly of the additional pressure of getting the start and he could play with a free mind. Coming lower down would also increase his possibility of facing the spinners (though not necessarily) and even today he remains a good player of the turning ball. And most of all, relieved of the responsibility of grafting the innings, he could just play short cameos to boost the score – something he would be very good at (since he’s never been the best of runners between the wickets). Aside from his rusty batting, the callous run out of Callum Ferguson and Pandey’s suicidal wild swipe shall go down as examples of batting harakiri. But no accolades are enough for Steve Smith. He played unconventional shots, he played the Dilscoop successfully, he square cuts with a vengeance (reminds me of south Africa born English cricketer Robin Smith of Hampshire – he used to cut with a lot of power and grace as well) and he ran and dived for his life. He also has some bowling skills with the leg breaks. Though Ganguly did not repose enough faith in his bowling for today (or maybe he is just holding him back for later), I have seen him in action and when he can get it right he is a handful (as are all leggies). The problem is both Rahul Sharma and Stevie Smith are in the same mould of leg spinning – the Anil Kumble type. They are not big turners and depend more on line, length, variation of pace and bounce to get their wickets. Rahul is miles ahead, in my book, when it comes to leggie skills but with some mentoring, Smith can be a handful as well. In any case, Pune’s bowling seems well stacked and their fielding (apart from a screamer of a throw from Manish Pandey or Callum Ferguson – I am not sure who – that leached 6 runs and a needless Marlon Samuels direct hit that leaked an extra run) was decent too. There were a few lapses but they did not lead to any major disasters. Uthappa needs to get his act together behind the stumps. Though he did not drop any catches or let any byes through, his keeping was, in general, sloppy and it showed through that he was not a regular keeper. Anyways. There is a long way to go and Pune have a past history of starting well to end up sputtering badly (they won their first two matches last season and yet ended up at the bottom of the table). So one cannot really place their money on them, but as far as I am concerned, Dada is there. So I am rooting for them. You may call me a traitor for not supporting Kolkata, my city of residence, but Saurav Ganguly means a whole lot more to me than just a cricketer. He is an idol for me. Not just because of his cricketing skills, because there are greater cricketers than him, but because of some other qualities. His never say die attitude, his aggressiveness, his desire to prove his detractors wrong and his ability to bounce back time and again after being written off have all been a major influence on me. He never bowed down to others. He did not play the game for money (his family is one of the richest in Bengal – hence, his nickname, Maharaja), his leadership skills all have stamped their undying mark in the history of Indian cricket. He took a team that was marred by controversies of match fixing after the sacking of his disgraced predecessor and made them into a team of honest, committed players. He took a team that was always cowed down and backed off in the face of Australian or English sledging and made them grow the confidence to talk back. He made the Oz skipper wait down at the toss because he wanted to send a message to them (which Steven Waugh received and comprehended very well). He played the game hard and true – much in the style of the Australians themselves. For me, Saurav Ganguly is more than just a cricketer. He is an inspiration. Tags: Cricket, Dada, Ganguly, Inspiration, IPL, postaday, Saurav Ganguly. Bookmark the permalink.